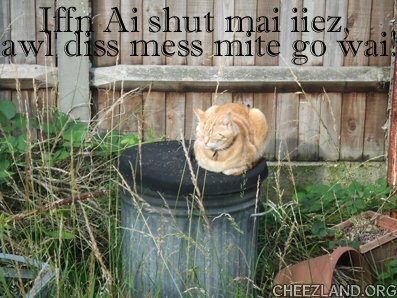 Anni sez: Not sure if this is Ginge or another marmalade kitteh sitting on the bin where I keep potting compost in my sadly neglected garden. An a lawt uv it haz, kitteh! ai hazta keap ais shut insyde an owt. U an me bofe, mqos! An dere iz nowun libbin heer sept me! Onlee az long az yore eyes are shut, Kitteh. Reely, Ai’ve tried. Achoolee, Ai haz cleerd sum uv dem weedz. Dey aer gaynin awn me in teh rest uv teh gardin tho! In Cheezland, the time is 04:43.